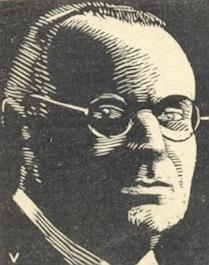 New York, 1927 was also given as the venue by Irving Chernev (‘This is the way I heard it back in 1927, when it occurred’) on pages 15-16 of The Bright Side of Chess (Philadelphia, 1948). 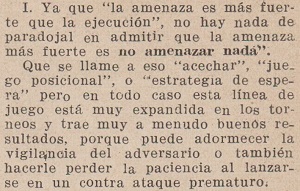 Nimzowitsch, we are told, complained to the tournament committee that Vidmar looked as if he wanted to smoke a cigar, but Chernev mentioned no remark about the threat being stronger than the execution. It is not possible to say when the story first appeared in print. 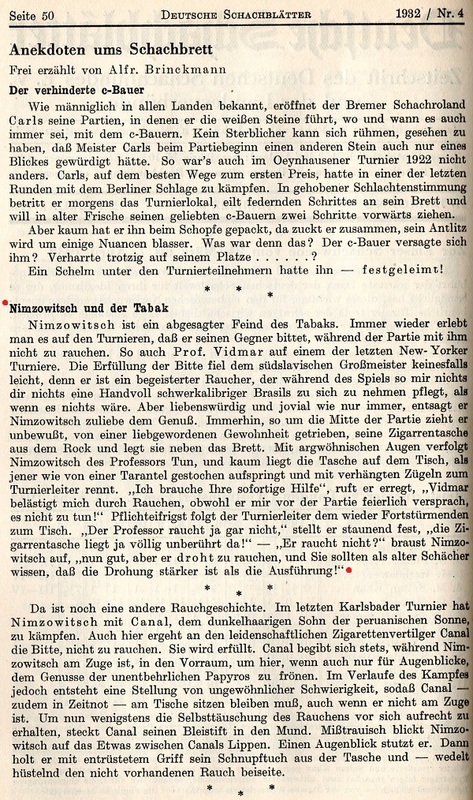 After Alfred Brinckmann had related it in Deutsche Schachblätter in 1932, the BCM (page 307 of the July 1932 issue) accorded it 16 lines, stating that Nimzowitsch’s objection to tobacco smoke was well known but that ‘A. Brinckmann tells what is to us a new story in this connection’. 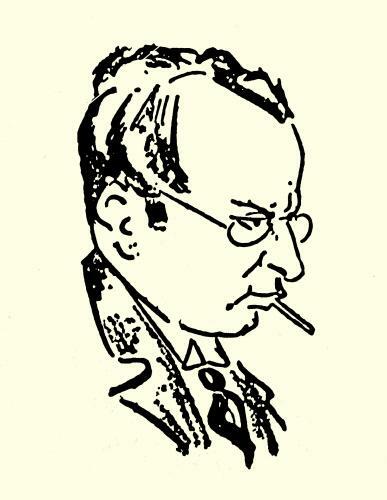 According to the Brinckmann version (New York, 1927, Vidmar, cigars), the Nimzowitsch punchline to the unnamed tournament director was ‘No, but he is threatening to smoke, and as an old player you must know that the threat is stronger than the execution’. How far back is it possible to trace the ‘threat/execution’ remark, in the writings of Tartakower, Nimzowitsch or anybody else? 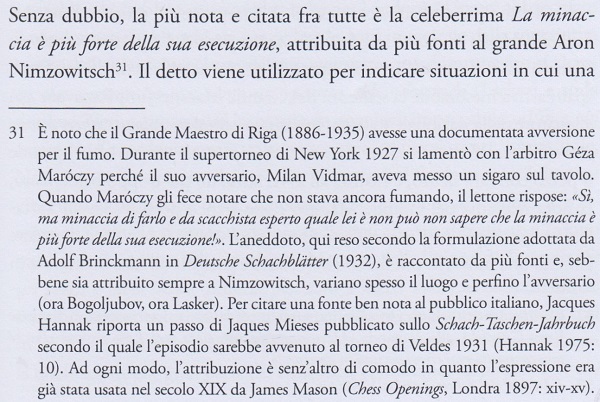 And did Maróczy ever pen an account of any such Nimzowitsch incident at New York, 1927? Despite Nimzowitsch’s well-known dislike of tobacco, page 87 of Visiting Mrs Nabokov by Martin Amis (London, 1993) affirmed that ‘Nimzowitsch used to smoke an especially noxious cigar’. ‘A threat or menace of exchange, or of occupation of some important point, is often far more effective than its actual execution. For example, in the Ruy López impending BxKt causes the defender much uneasiness. He is, to some extent, obliged to confound the possible with the probable; while yet at the same time in serious doubt as to what may really happen. In Visiting Mrs Nabokov the article by Martin Amis, on pages 83-93, was entitled ‘Chess: Kasparov v. Karpov’. It originally appeared under the title ‘The Masters and the Mafia’ on pages of 17-18 of the Observer Review, 27 July 1986. In fact, the only instance found so far of Nimzowitsch putting forward this principle was in a 1933 magazine article (see C.N. 3200). A footnote described Eisenbach as one of the deepest chess thinkers: ‘Sekretär der Wiener Schachgesellschaft, einer der gründlichsten Schachdenker, † 1894’. 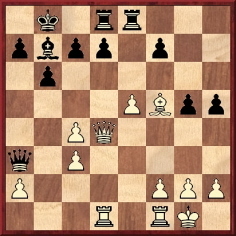 In a list of ‘maxims and advice’ on page 229 of A Breviary of Chess (London, 1937) Tartakower included ‘A threat is more powerful than its execution’, and attributed it to Tarrasch. ‘On one occasion during an important tournament Dr Vidmar playfully placed his cigar case, full of cigars, on the playing table. Though Vidmar showed no sign of wanting to smoke, Nimzowitsch was greatly agitated. Finally, unable to control himself any longer, he ran off to the tournament director with his complaint. Source: page 86 of Chess Beginner to Expert by Larry Evans (Wellesley Hills, 1967). See too Chess: Jacqueline and Gregor Piatigorsky. Any assumption that the footnote is the result of original research by Mr Garrett will be dispelled by scrutiny of our feature article A Nimzowitsch Story. He can, though, take responsibility for ‘Adolf’ (instead of Alfred) Brinckmann, as well as for ‘Jaques’ (instead of Jacques) Mieses. 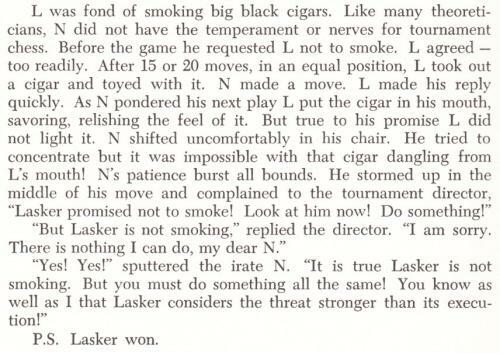 The question now is why Hannak specified that the smoking incident occurred during one of the Nimzowitsch v Vidmar games (two short draws) at Bled, 1931. Latest update: 6 June 2018.